Sadness, even depression, has its place. It is a natural and useful reaction to trauma. Emotional shock has a physical effect and depression makes us want to be still, to lie down, to sit and stare. This leaves extra energy for the body to make repairs and provides a mental space in which we come to terms, absorb the impact of the crisis, accept that this is where we are now. However, what if, once the restoration work on the body is done, we are still stuck in that emotional place? What then? Three hundred and fifty years ago a writer named John Bunyan wrote an allegorical story about a man, Christian, on a journey, who found himself in that situation. Bunyan called it The Slough of Despond, a miry marsh. Christian gets bogged down there but manages to get from one side of it to the other where he finds help to get out. When you’re ready you can find help in friends, family, self-help materials, therapists, counsellors, and other professional advisors, to move up and out of emotions at the bottom of scale or ladder. (You can see below that it has despair at the bottom and joy at the top). What has this got to do with films? They can be a valuable, accessible and easy form of help. Some films that may be rated as depressing can simply assist you to register what the change of circumstances means for you. Others can help you with feeling better about that change. Some might make you angry at the injustice of the hero’s situation and anger is up the laddder from feeling powerless. According to the Law of Attraction, emotional states cause the body to emit a signal, a vibration that at its highest attracts the best and brightest of events, people and ideas. Regardless of the controversy over this idea, it is generally agreed that feeling good is better for your well-being than feeling bad, giving you more energy and focus to achieve your goals that contribute to your happiness. This is why moving up the emotional scale or ladder is so desirable. Supplementary therapies that use the arts, such as music therapy, are emerging and now include film, which is my area of focus and the impetus behind the project ‘Fifty Feel-better Films’ created especially for people on the lower half of the scale. 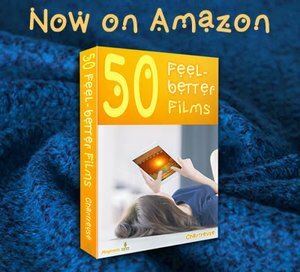 If you want to see how a film reviewed on heypressto.com might have a therapeutic effect, a list from Esther Hicks’ book Ask and It is Given of emotional states in descending order is posted in the right-hand column of the home page on this website for reference. Films reviewed usually have a ‘feel-better rating’ at the top. Feel-better films are rare so if one scores a rating of even one then it has something of value to offer. If you have any films in mind that you would like reviewed or included here, I’d love to hear from you.